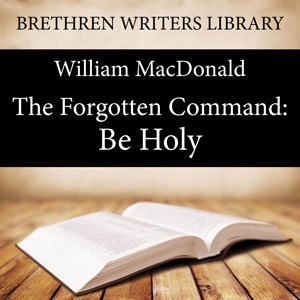 The Forgotten Command: Be Holy is a clarion call for all Christians to follow their Master’s command and to Be Holy. In the world of today, where holiness is set aside and considered to be outdated, the vital truth of holy living by the Christian has never been more relevant. Christlikeness produces Holiness, and William MacDonald stresses its importance as he looks at every aspect of the Christian life. “The moment we are saved, we are given a position of holiness before God. Because we are in Christ, we have a holy standing. Our responsibility is to see that our practice corresponds to our position, our state to our standing. This book makes compelling and searching listening for those who are serious about obeying the Forgotten Command: Be Holy. William (Bill) MacDonald was born in Massachusetts. His parents were from the Isle of Lewis and when he was six years old, his family moved to Stornoway, Scotland, later moving back to Massachusetts.